Xylocopa virginica virginica (Eastern Carpenter Bee) ♂. Size: approx. 15-20 mm. Photo: 09/05/11, 2 pm. A rather big bee with yellow "fur" on the thorax and a black hairless abdomen. 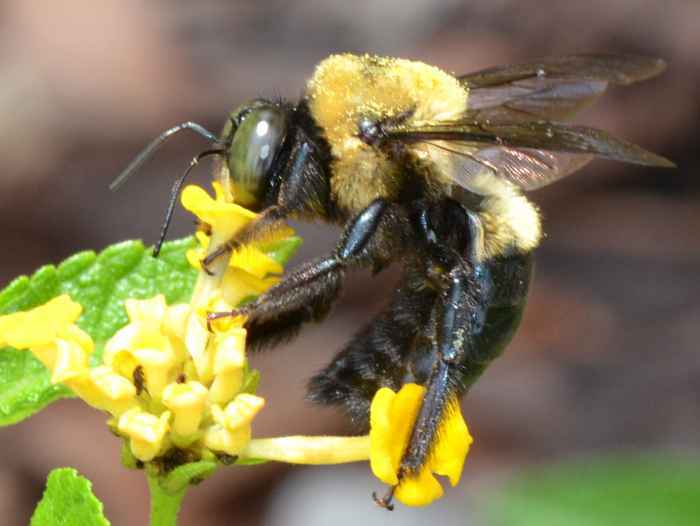 This is a Common Carpenter Bee (Xylocopa virginica). They build their nests (galleries) in dry wood, especially in conifers. 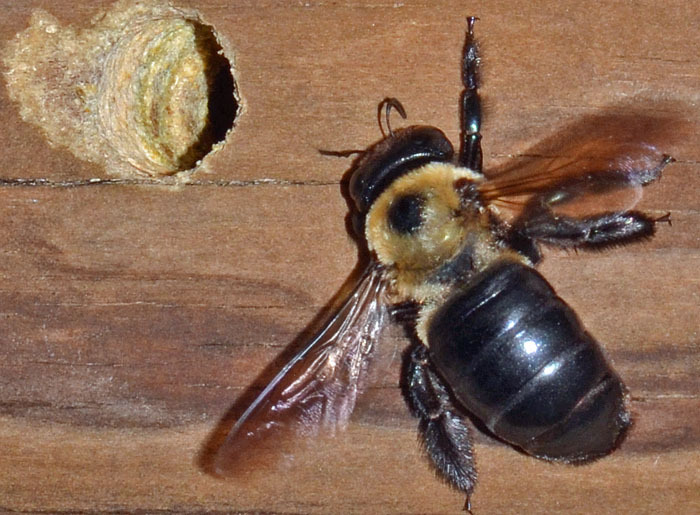 Carpenter bees only rarely damage varnished or painted wood. Xylocopa virginica (Eastern Carpenter Bee) ♀. Size: approx. 20 mm. Photo: 06/28/14, 5 pm. Female underneath my balcony. 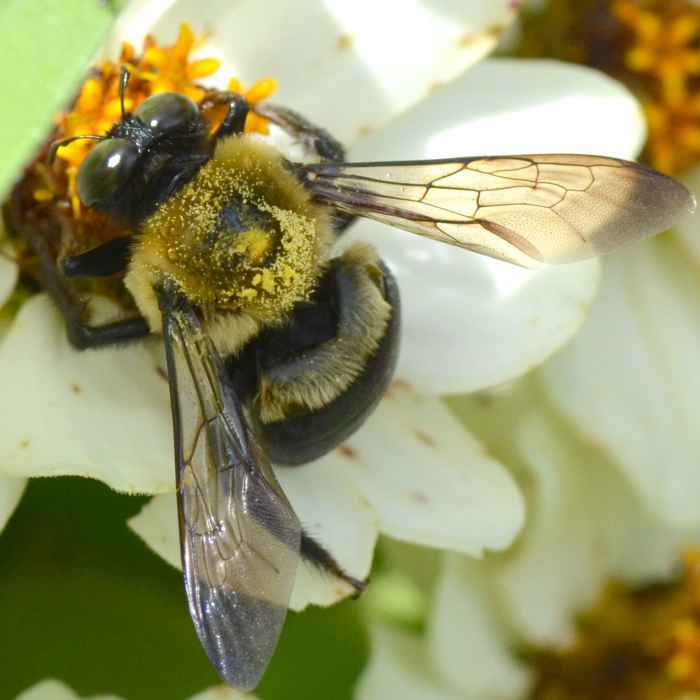 From Balduf (see link): "In new nests, female bees chewed their way into the wood, excavating a burrow about 15 mm in diameter. If the grain were oriented vertically, the nests were vertical; if horizontally, then the nests were horizontal with respect to the ground. Galleries extended about 30 to 45 cm in newly completed nests. These older galleries were believed to have been used by several generations of bees. After excavating the gallery, female bees gathered pollen, which was mixed with regurgitated nectar. The pollen mass was placed at the end of a gallery, an egg was laid, and the female placed a partition or cap over the cell composed of chewed wood pulp. This process was repeated until a linear complement of six to eight end-to-end cells was completed."